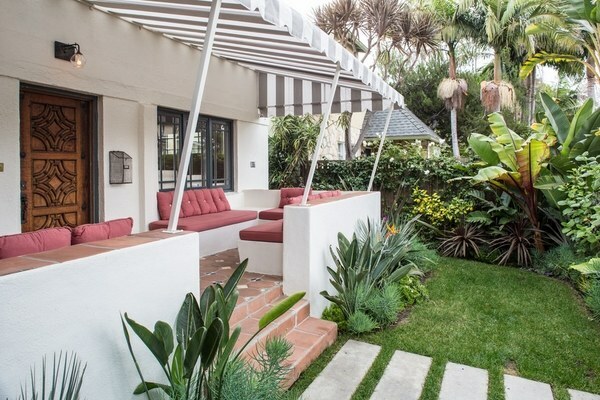 Porch awnings ideas come in a wide variety. They are a great addition to any home and outdoor space. 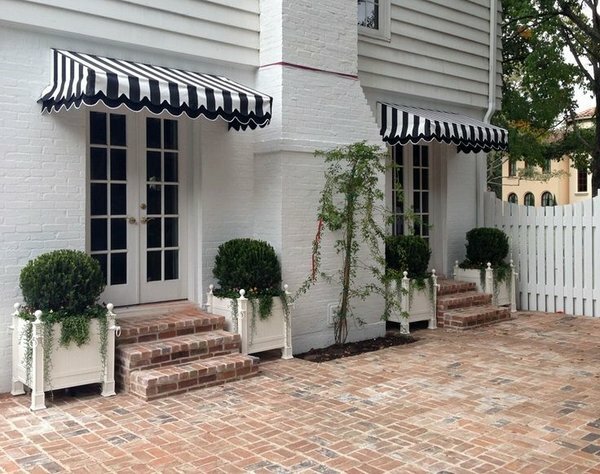 Awnings are functional, they add beauty to the exterior and protection from sun, wind or rain, and add to the curb appeal while saving money on energy cost. 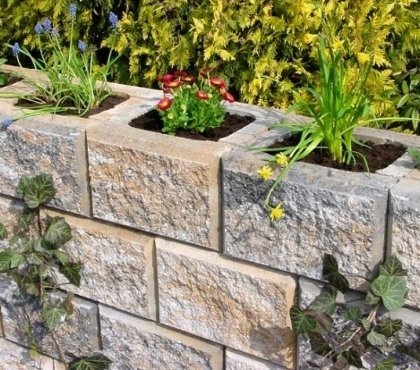 They allow you to enjoy time outdoors and significantly add to the overall appearance of your home. In addition, they add value to your property. 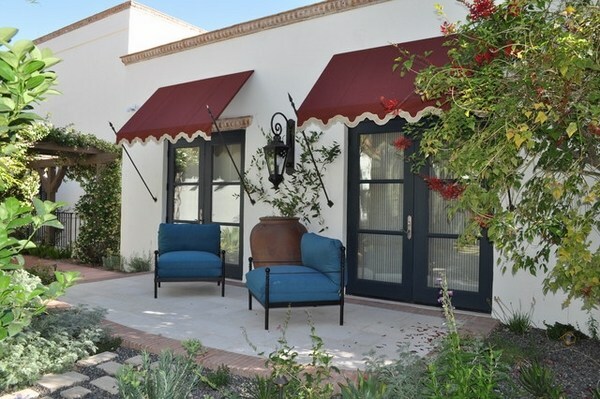 The market offers different types of awnings and you can choose from a variety of colors, patterns and motifs in order to match them with the style of your home. 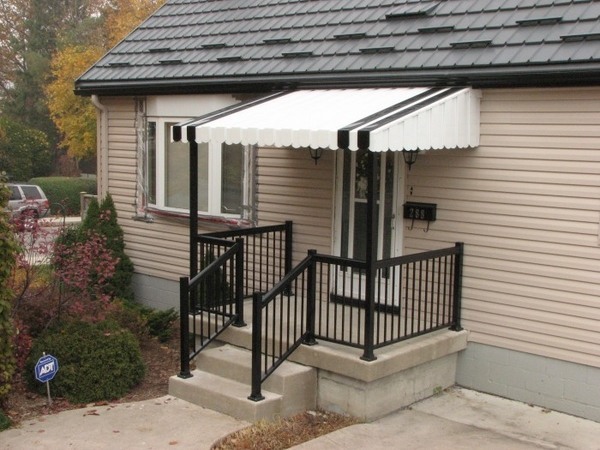 As per the type of installation, porch awnings can be permanently fixed or retractable. Fixed awnings, also called “stationary” are not retractable. Those are permanent constructions and come at a more affordable price. 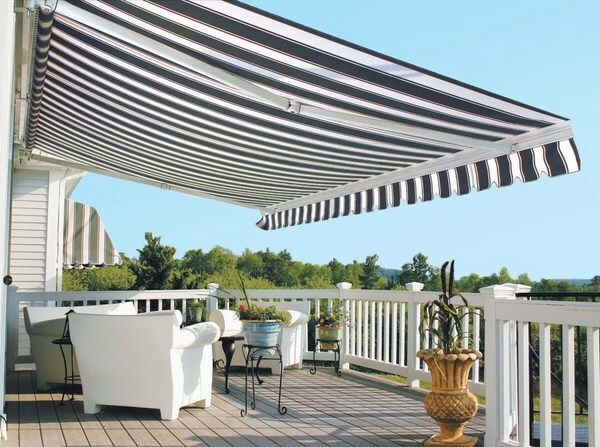 Fixed awnings will protect your outdoor furniture from too much exposure to direct sunlight which may cause fading. 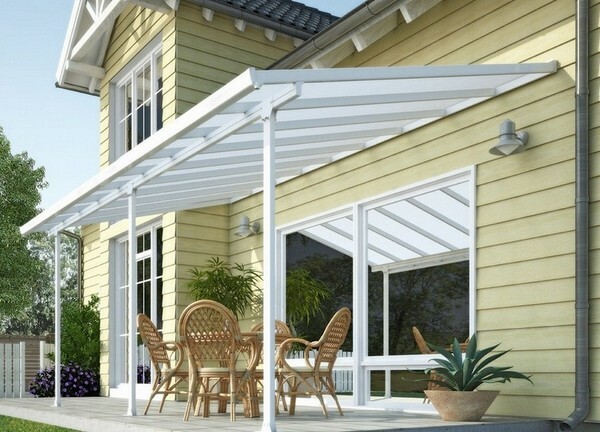 Retractable awnings offer greater flexibility and you can open and retract them easily. 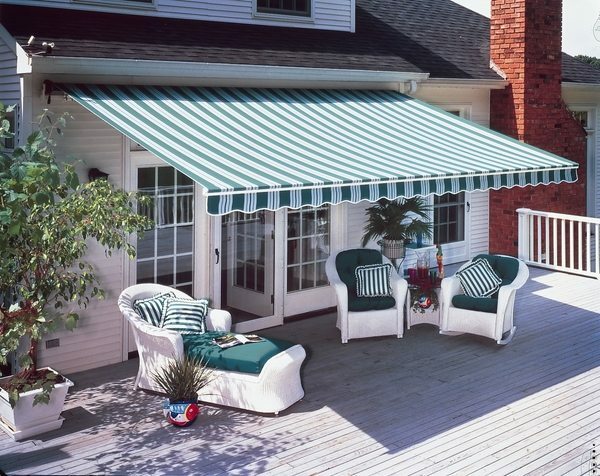 They can be operated manually or with a remote control and the mechanism of manually operated awnings is easier. That is why they are less expensive compared to motor operated awnings. 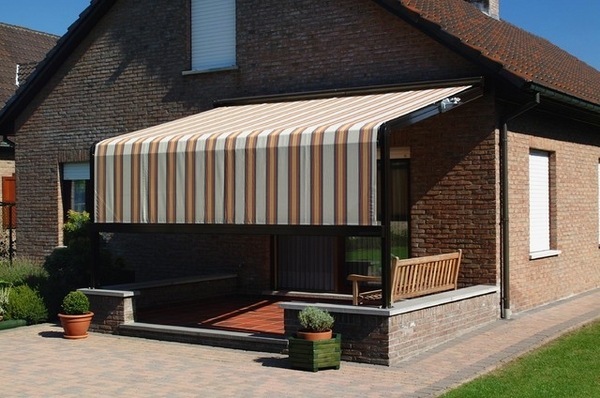 Despite the lack of motor, manually operated awnings are designed for easy operation – they can be opened or closed without any effort and they require less maintenance. 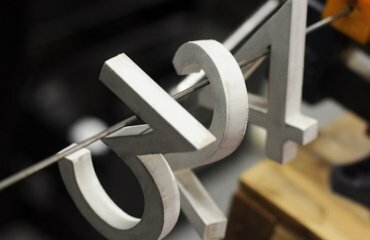 Motorized retractable models are especially popular among homeowners as they are very convenient to use and can be opened or closed with a remote control. Some models are equipped with modern wind sensors which will close the awnings during high winds. 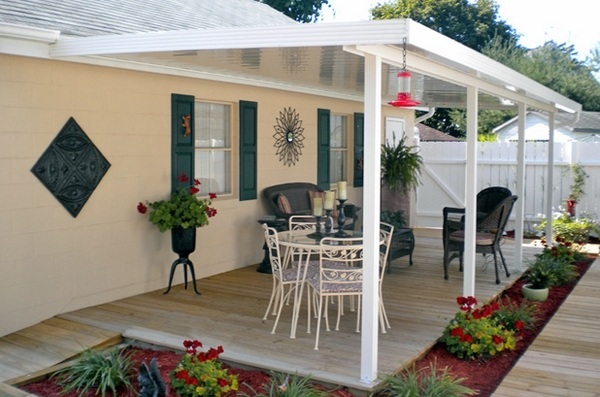 Choosing the type and the material of the porch awnings depends on many factors. 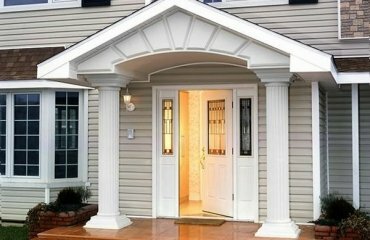 From a simple portico over the door to permanents constructions, the options vary in price, type of installation, material, appearance, style and design. 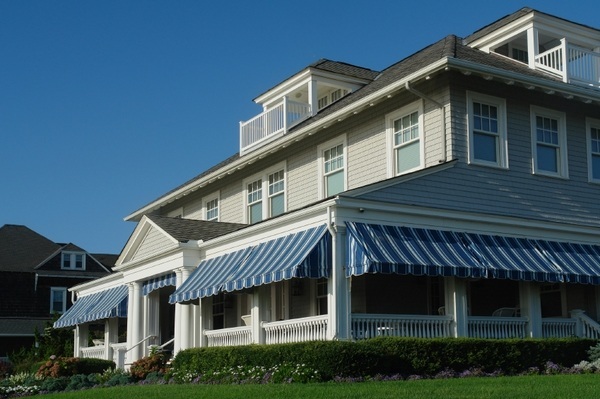 We shall look at the different types of porch awnings, their advantages and disadvantages, the types of materials and the benefits that they offer to the customers. 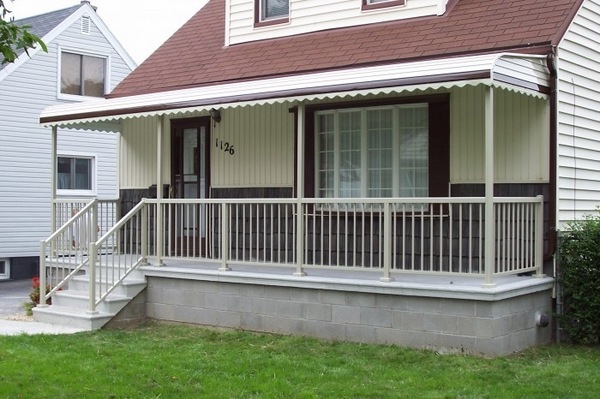 Porch awnings ideas include different types – door, window, front porch, deck awnings and you can install one or all types, depending on your needs. Usually, the installation is determined by the amount of sunlight and the position of the windows or the porch. So where do you need to install sunshade depending on the facade direction? 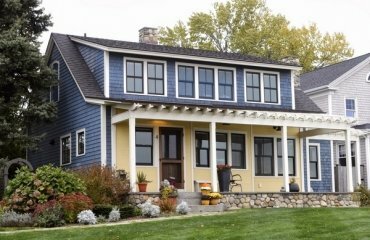 The solar heat can be reduced up to 65% when installing awnings on South facing windows or porch. 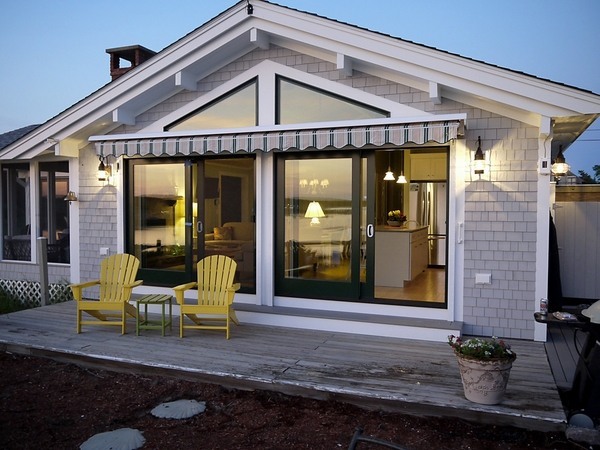 North facing windows or porch are usually protected with awnings without sides as they are exposed to sunlight early in the morning while East and West facing facades are exposed to significant sunlight and the heat can be reduced up to 70% when adding awnings. 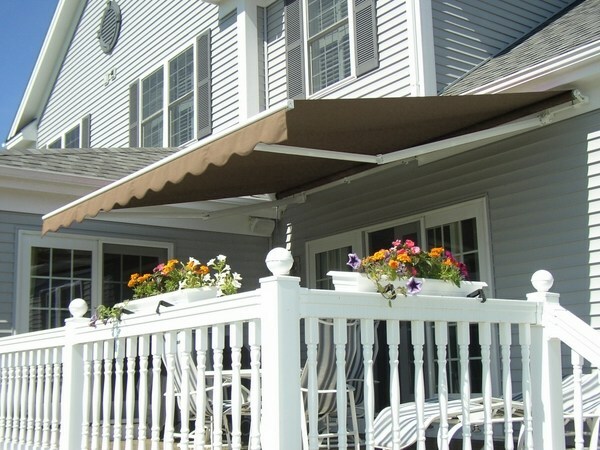 Awnings with sides are especially suitable as they provide better sun protection. 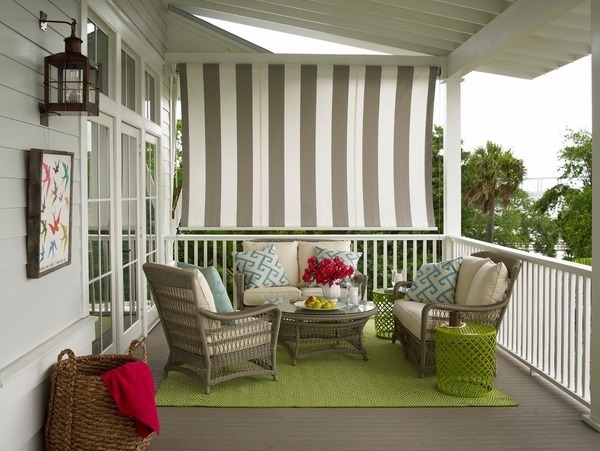 When choosing the type of your patio or porch awnings you need to consider a few important factors which will make your investment worthy. The first one is the insulation. Most often people install sunshade to provide insulation against extreme heat or rain. 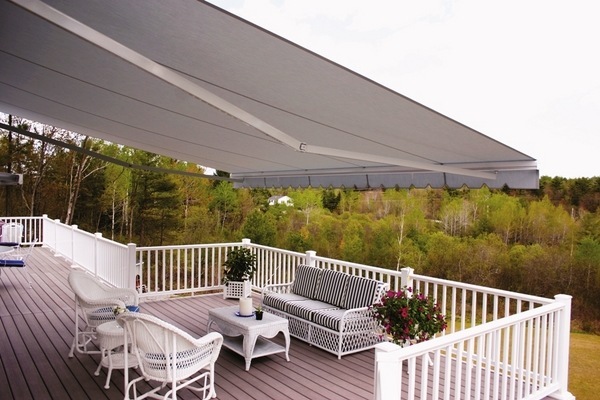 Keep in mind that retractable awnings have better insulation features due to the fact that the canvas does not get as hot as aluminum covers. They come in a variety of sizes and the canvas spread can be quite large, respectively – the protected area. 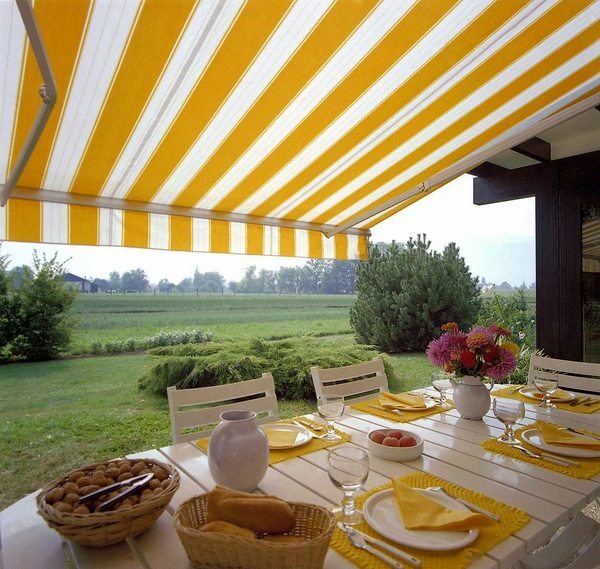 Many types of retractable cloth awnings offer additional UV-protection. A disadvantage of cloth awnings is that in rainy conditions they need time to dry, unless you opt for water resistant canvas. 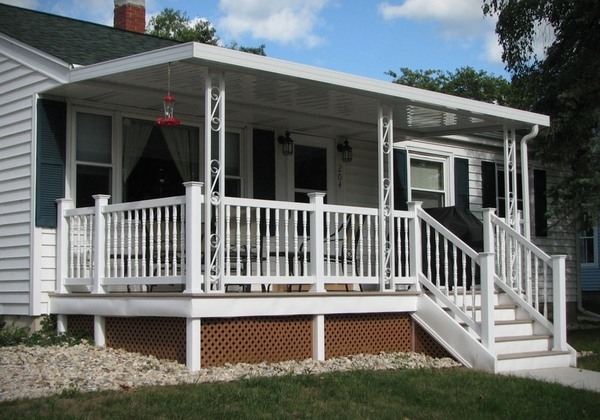 Durability and maintenance are other important factors to consider when choosing the porch sunshade for your home. 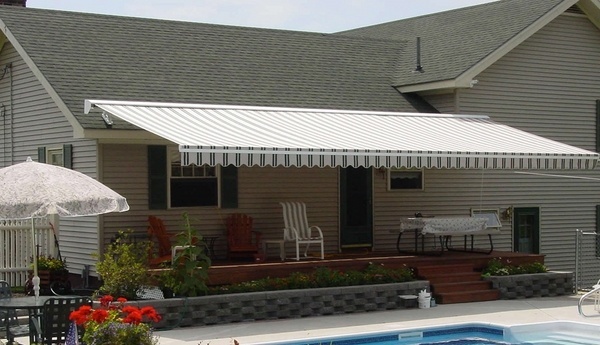 Modern cloth canvas is manufactured to last for many years but aluminum awnings have a bigger life span. You need to be aware that they have metal parts that may corrode with time, while retractable mechanisms are hidden and protected from rust. 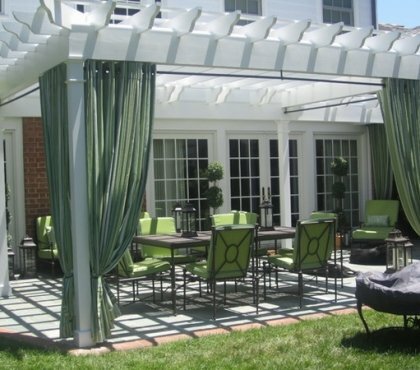 So, if you look for durable, easy to maintain awnings, retractable models are a better choice. 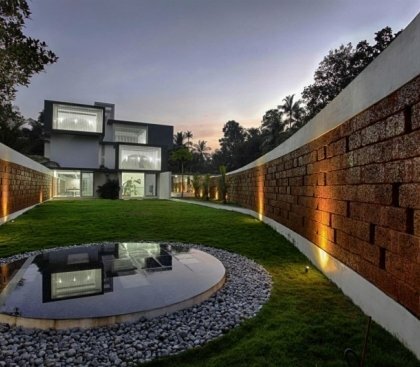 Visual and aesthetic appeal is another consideration. 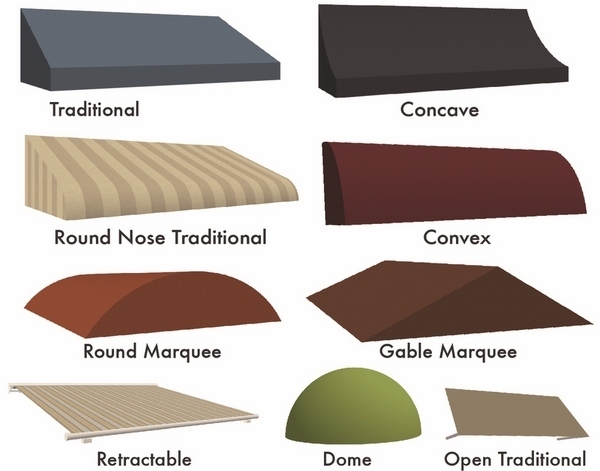 The market offers numerous choices of retractable awning canvas and you can find a color or pattern that will complement the exterior of your home. With fixed constructions, the choices and customization options are limited and come at a higher cost. 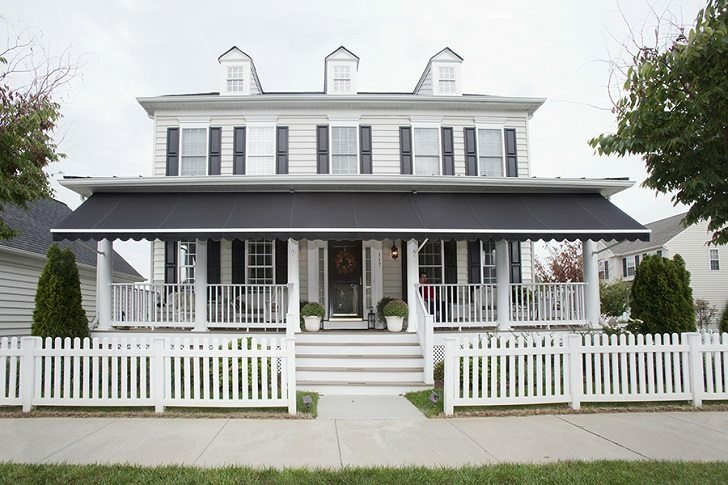 If you do not want to see any poles which are a typical feature of any fixed construction, choosing retractable awnings is a better option as the canvas is the only visible part which adds a lot of style and elegance to the exterior of the house. 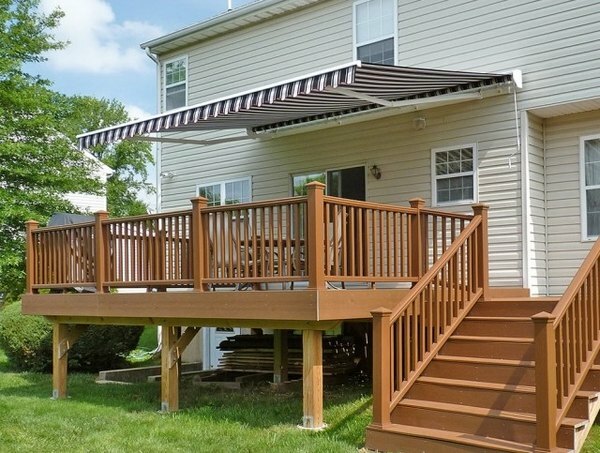 Let’s look at the advantages of porch awnings and the benefits that they offer to the occupants of the home. 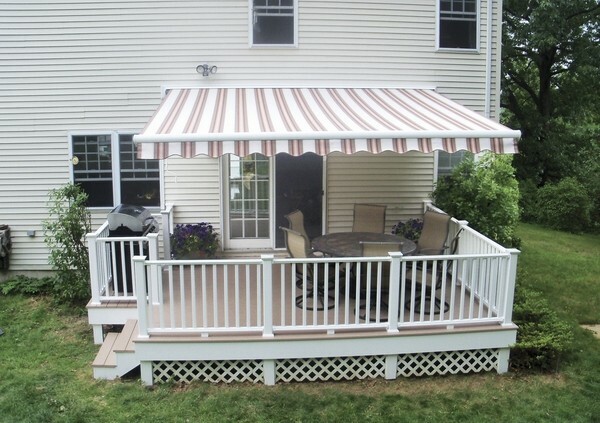 On the first place, porch awnings allow you to extend your living space, as they can be fixed to any structure, and offer a convenient protection to you, your family and guests while enjoying time outdoors. 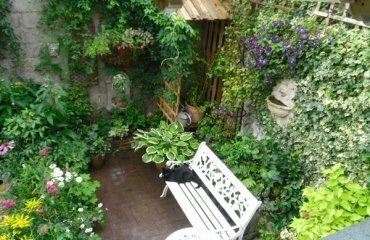 In addition they will protect your outdoor furniture or carpets, from fading and can help you reduce your energy bills. 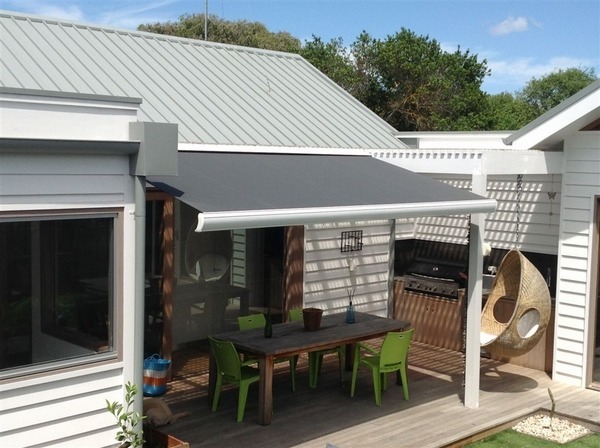 You can choose between fixed constructions or retractable porch awnings depending on your personal taste, the architecture of the house, the style of the exterior and of course – your budget. Many manufacturers of retractable awnings offer options for motorization, including wind sensors, rain sensors, timers, and remote controls which make them much more easy to use. 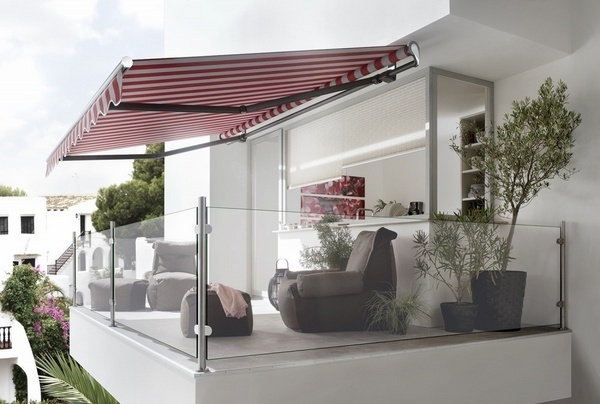 The flexibility that retractable awnings offer is another advantage as you can open and close them easily at will. They can be rolled during harsh weather and when rolled they will not get damaged by harsh winds, stormy conditions or heavy snowfall. 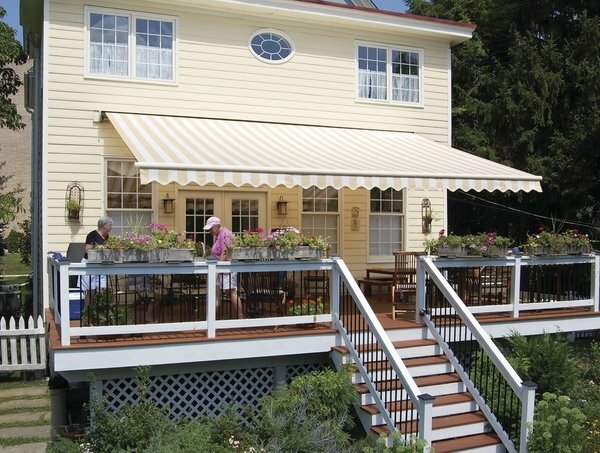 Whether manually operated or motorized, retractable awnings are easy to open and close. 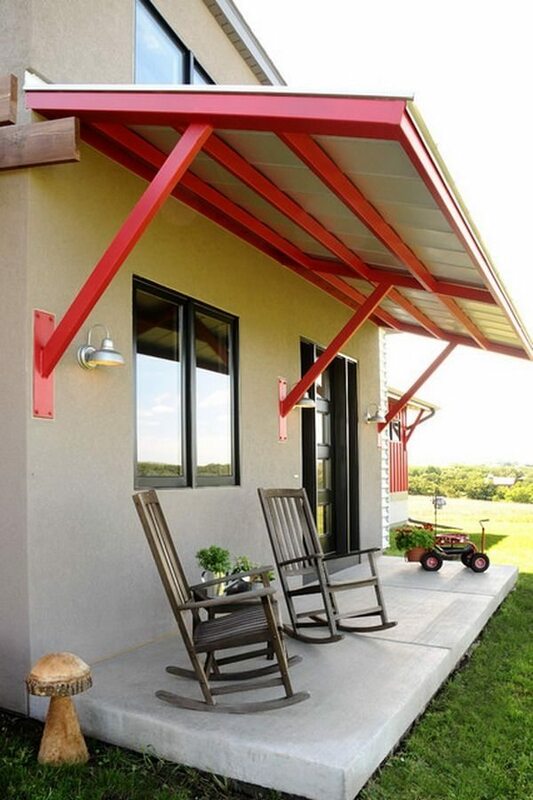 Porch awnings ideas – how to choose the best material? 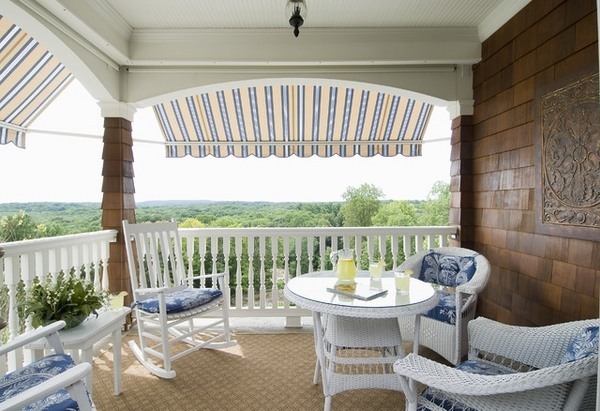 Porch awnings ideas come in a variety of shapes, sizes, design, styles and materials. They may have sides for additional protection. If you consider installing sunshade you need to decide which type of awnings – fixed or retractable – is suitable for your home. Choosing the size of the awning is another issue. 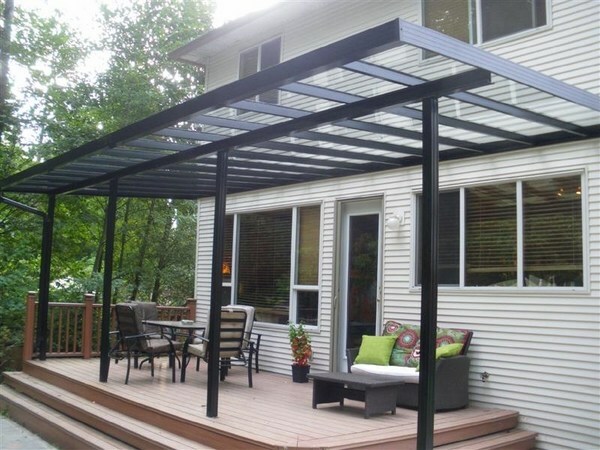 For small spaces canopy awnings are a good option as they will provide protection from sun and rain quite effectively. 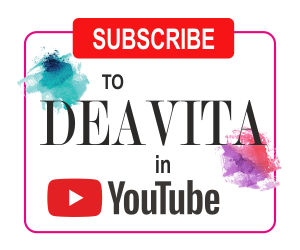 Choosing the material is another significant decision that you need to make – fabric, aluminum, corrugated polycarbonate or fiberglass, as well as other durable and long-lasting materials. 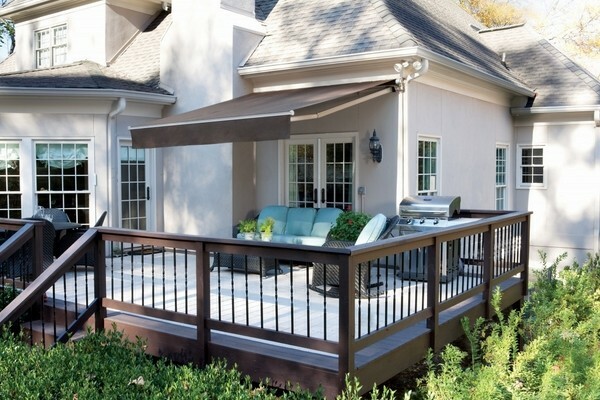 Some homeowners prefer DIY projects and choose to buy awning kits from stores. 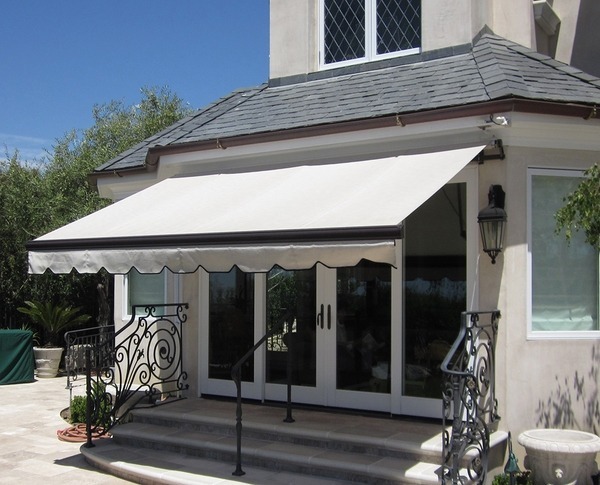 Canvas awnings or awnings made of natural materials are inexpensive but require a lot of maintenance. 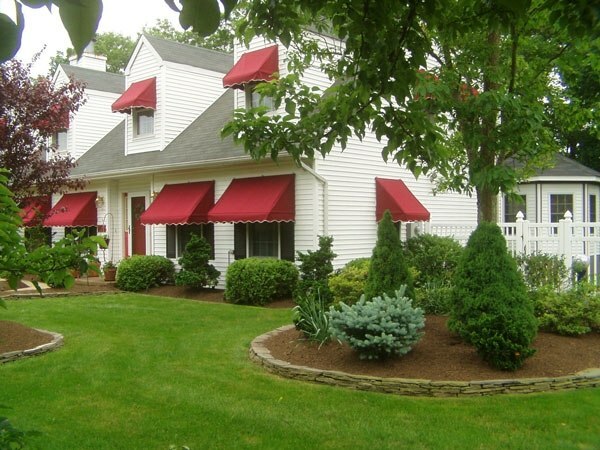 Canvas awnings are susceptible to mold, mildew, and rot and their major disadvantage is the limited lifespan. 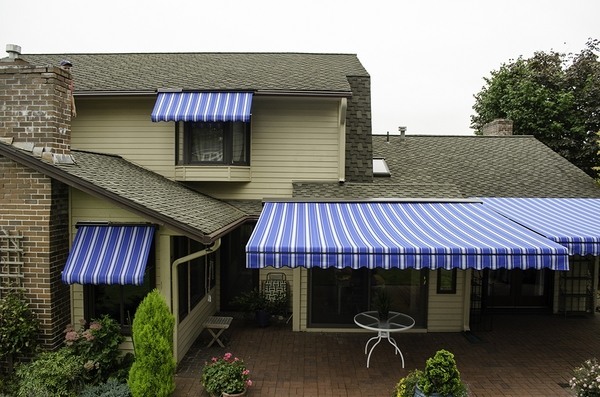 Awnings made of acrylic fabrics (or acrylic-coated synthetic fabrics) are stronger that canvas made of natural materials and they repel water effectively. These fabrics are made of dyed acrylic yarns and are not susceptible to sun damage. They will retain their color for a long time and will not fade. In addition, they are resistant to mildew and damage from ultraviolet light. 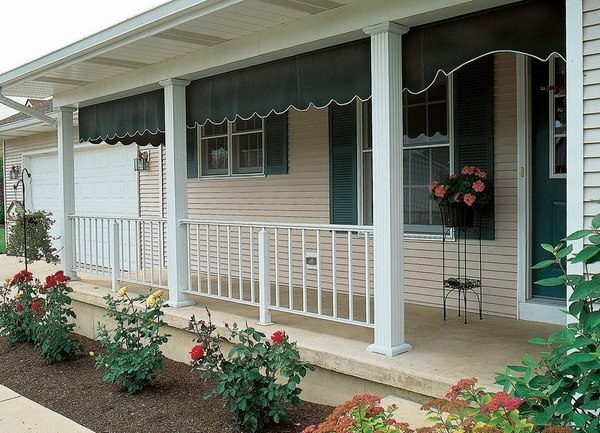 Porch awning fabrics can be coated with vinyl. Such fabrics are heavier than acrylic and acrylic-coated materials and are a good option for areas with high humidity levels. Vinyl coated awnings are resistant to UV light and mildew, they are easy to clean and quite strong, but come in a limited variety of colors and styles. 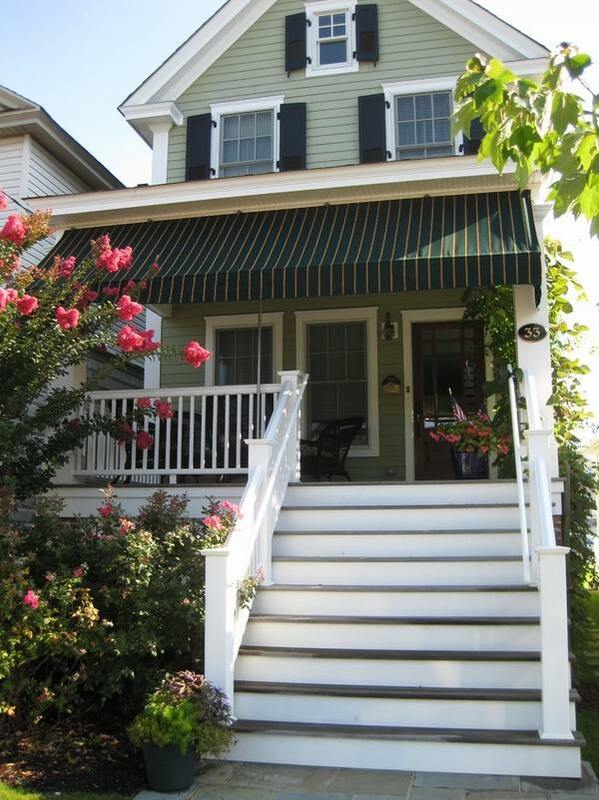 Metal porch awnings are a more expensive option. These fixed models are especially popular in contemporary styled exteriors for the great visual appeal. 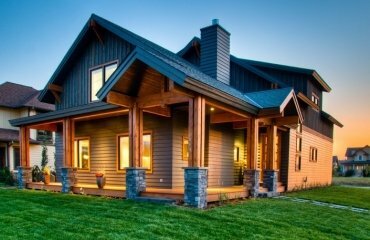 Steel aluminum, copper – there are different options and you can choose the one that suits your taste and budget. 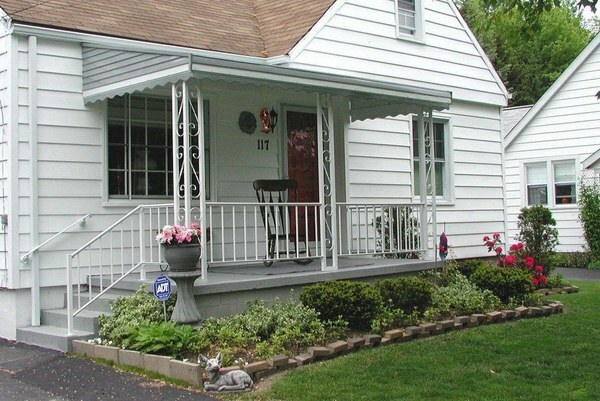 Aluminum porch awnings are the most popular type as they come in a variety of colors, they work with many exterior styles and offer great durability as they are resistant to fading and flaking. Steel awnings require protection to prevent rust while copper offer the most appealing look but come at the highest price. 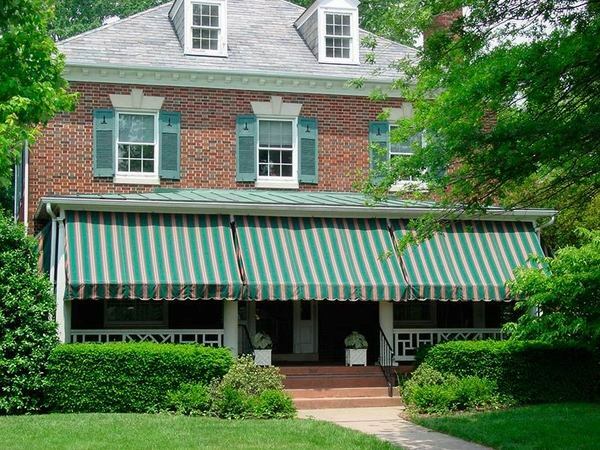 Metal awnings cannot be rolled up. They are permanent constructions. Optionally, some models are equipped with hinges to adjust the sunshade up and down. 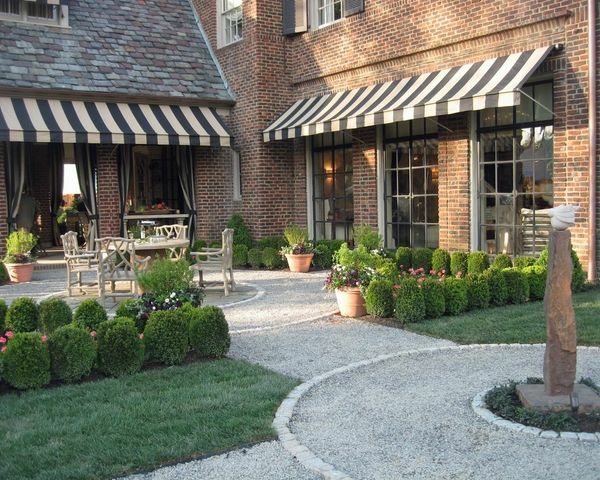 Fiberglass awnings are the lighter alternative. These do not need painting and come in an opaque or translucent variety. 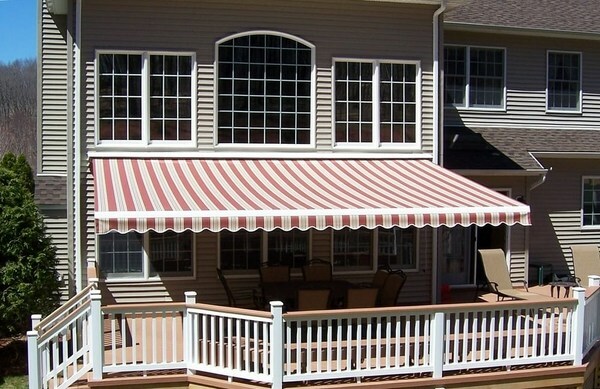 However, fiberglass awnings become brittle over time or they may crack and have to be replaced.